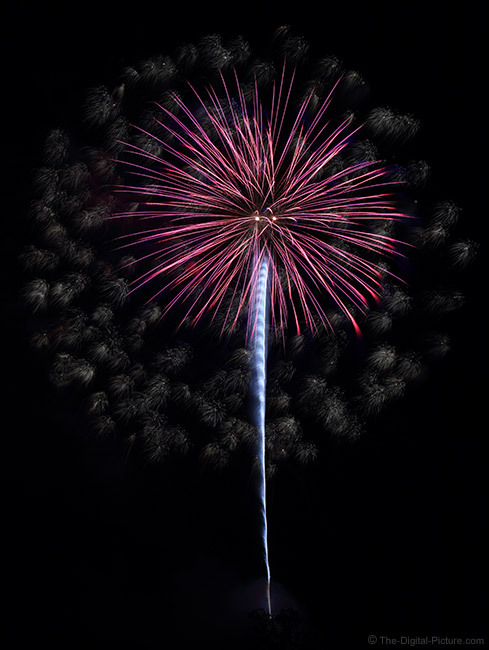 Fireworks are captivating, especially from a photography perspective. But even a captivating subject can become mundane over time. The local fireworks show happens annually during the summer and attending has become our family tradition. This is not a New York City East River-scale fireworks show, but it is well done, is relatively low effort to attend and is very easy to photograph. After photographing the show over many years, I've grown somewhat bored with the same-old imagery and have been looking for something different. While I have a great unobstructed view from a close distance, the area is void of additional subject matter to include in these shots. A technique that is showing some popularity right now is to utilize manual focus ring adjustment during exposure to change the appearance of the fireworks. 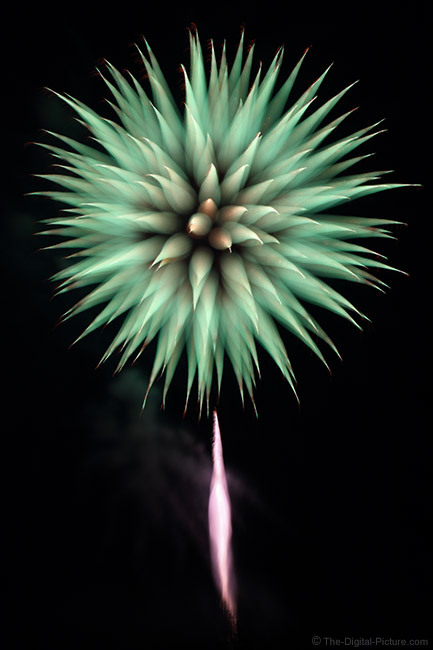 When in focus, fireworks blasts appear as thin lines arcing through the frame during long (bulb) exposures. When out of focus, those lines become thick. If you rack focus during the exposure, those lines can be made to vary in thickness. A key to long exposure photography is visualization and this technique will exercise your brain in this regard. But, there are no rules and the technique is not hard to try. Before the shoot, establish the ideal infinity sharp focus distance mark in the focus distance window or using the distances printed on the lens. Note that this may not be at the full rotation extent of your focus ring and the subject may become blurred at focus distance longer. This is true even though fireworks photographed at a safe distance would be considered at infinity. Remember the ideal setting and have a small, dim (to not bother others nearby) flashlight handy to allow re-establishing of sharp focus. As Tony suggested, Follow Focus device (even an inexpensive model) can work great for this purpose as long as the slected model cannot be rotated beyond set stop points (or care is taken to avoid this). Ideally, press and hold the remote release to open the shutter immediately when a rocket is launched. As the rocket explodes, adjust focus smoothly until the burst goes dark and stop the exposure. How much rotation to give the focus ring depends on the focal length, aperture and lens being used. A telephoto focal length is going to create a stronger blur more rapidly than a wide angle lens. A wide aperture will create a stronger blur more rapidly than a narrow aperture. Lenses have differing focus ring rates that also need to be accounted for. The rate of focus adjustment also plays a role in the final shape of the blurs. Use your creativity to expand the focus blur technique. For example, capture two subsequent explosions with the focus ring going in opposite directions. Or just leave the entire explosion blurred. There is no reason that you cannot mix your standard fireworks photos with your creatively blurred versions. Too late to get creative in the field this year? Edit your fireworks photos in Photoshop or your favorite image editing app. Experiment with the blur filters available to you there. The fireworks images on this page were photographed a Canon EF 24-70mm f/4L IS USM Lens at about 47mm. This lens and focal length permitted an easy full extent focus adjustment. The camera was a Canon EOS 5Ds R. With the incredible resolution this camera offers, I framed the fireworks slightly wider than I typically do. This meant more cropping, but fewer large bursts went out of the frame. For the fireworks images on this page, I utilized a 2-stop neutral density filter. Without this filter, the softening effects from diffraction would have been noticeable with the required f/16 aperture. The filter permited a sharp f/8 aperture with properly exposed bursts. Are you bored of the standard fireworks pictures you capture regularly at your easy-to-attend location? 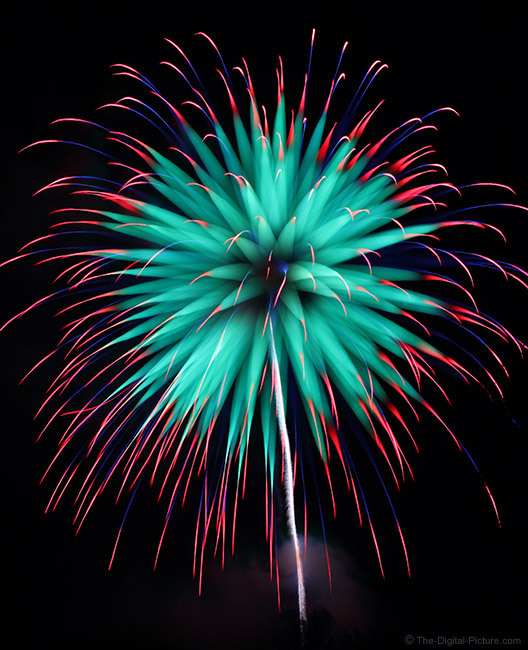 Are you tired of the thin lines of color in your fireworks images? 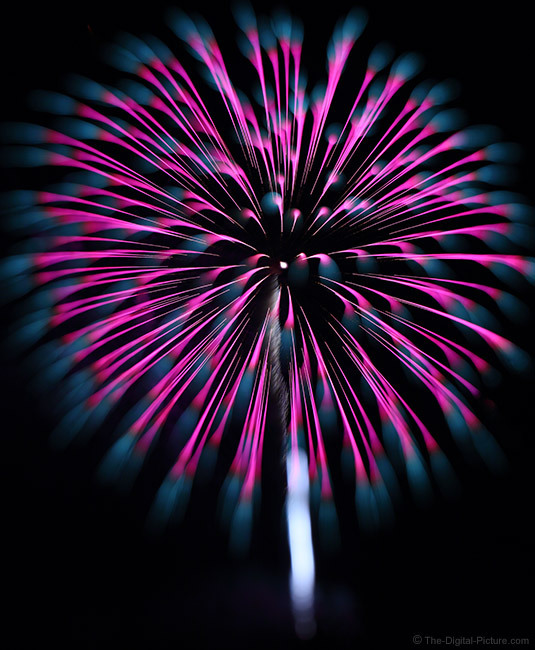 Get more frame coverage from your fireworks color by making them out of focus. 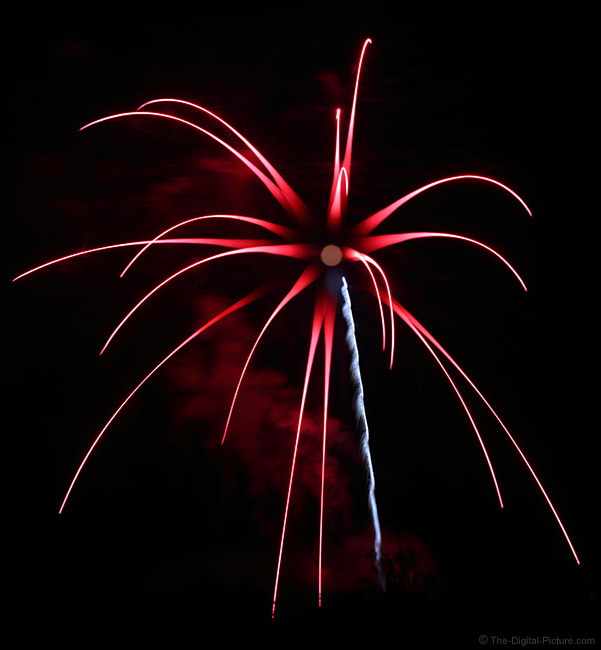 Learn more about fireworks photography.